with me for about 15 years. He had a severe phobia of children. Dogs sometimes experience psychological issues. The term "Dog Psychology" should not infer that we analyze a dog based upon his reaction to pictures of ink blots. It does not work like that, However, dogs do occasionally suffer from psychological issues. In this blog post, I attempt to address the psychological issues associated with anxiety and phobias in dogs. Anxiety in dogs factors into a lot of behavioral issues. In order to help the dog experiencing these issues, it is important that we understand a little about dog psychology. I work with a lot of dogs that have aggression and anxiety issues. Most of the time, these issues can be traced to some sort of trauma in earlier life. However, this is not always the case. So called, "inherited" fear is sometimes seen in entire litters of puppies. This type of fear is very difficult to address with training. The fear is persistent and tends to be generalized. In other words, the pups are generally fearful and reactive. This particular abnormality is generally observable in puppy-hood . It tends to begin around two to ten months of age and never completely goes away. Some breeds are generally highly reactive and tend to have this inherited fear. Some examples of affected breeds are German Shepherds and Pointers. However, even in the affected breeds, this does not affect every individual dog in the breed. Sometimes experiences in puppy-hood imprint on the dog and have a long lasting effect. Nervous mothers or litter mates can influence lasting anxiety on a pup. Poor nutrition in puppy-hood can have a negative effect on early mental development. Dogs that are isolated as pups tend to be reactive and very anxious as adults. Pups need stimuli at an early age. Their emotional development is negatively impacted when they are isolated from other dogs and/or people. Phobias, or irrational fears, in dogs can, in many cases, be traced to some early trauma. This happens because the dog associates a seemingly benign stimulus with a traumatic event. For example, a dog that is abused by a child may associate the pain of the abuse with all children. This dog may become extremely fearful of children. 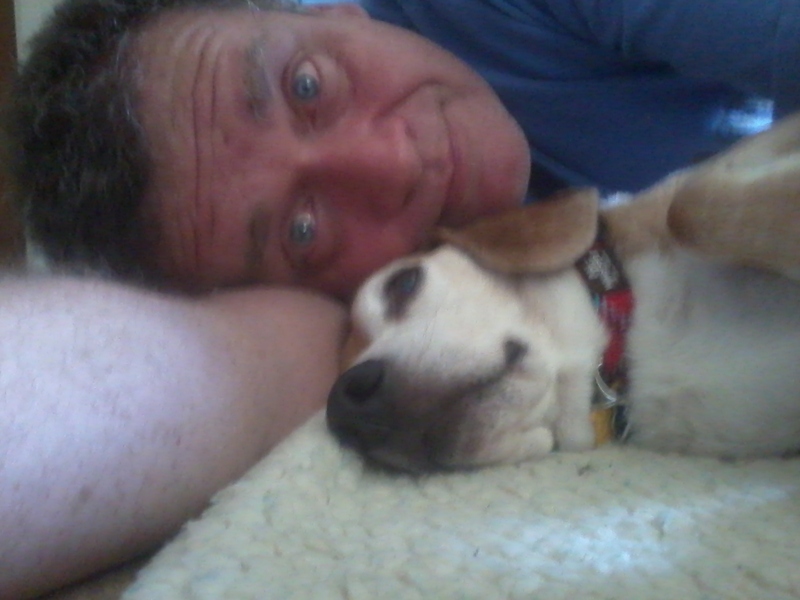 I suspect this is what happened in the earlier life of a beagle named Boomer that I adopted many years ago. Boomer was highly fearful of and aggressive toward young children. I did not live with any children so, it was safe for me to adopt him and work with him to address the issue. 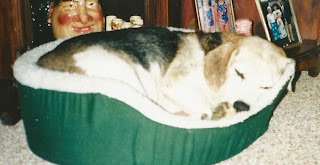 He was my loyal companion from the time he was nine months old until he died as a very happy senior dog at fifteen years of age. He was really a great beagle and I was somewhat successful in my attempts to help him with the phobia in regard to children. He got much better. It took many years, but he was eventually capable of being around children without growling, snapping, whimpering or getting physically ill. However, he never really became comfortable around children. He always showed subtle signs of stress when children were present. The point is that there was hope for Boomer. In the proper environment, he thrived. He would never have been suited for a home with young children but he was a great companion for me! It is important that we not set the dog up for failure. It would have been unrealistic to have expected Boomer to ever be a good dog for a child. That is something for which he was simply not emotionally nor psychologically capable. Yes, Boomer's fear was irrational. Not all children would hurt him. In fact many of them distributed tasty treats to him over the years, which he loved. But, he was always, at least slightly, stressed around children. Whether or not the fear is rational makes it no more or less real. Boomer's fear was very real for him. It was important that I understand that and not force him to do more than he could do. This is Cody relaxing with me. Dogs also frequently develop a phobia of the veterinarian. This is understandable. The dog is quite likely linking a trauma that the vet was treating with the veterinarian. For instance, shots hurt. I hate needles. Our little Cody also hates needles. He once cried loudly when the vet simply removed the cap from the end of the needle. He associated the sound with the pain. Cody now loves the vet because the nice people at the vets office are always giving him tasty treats. He knows where the treat jar is kept in the exam room and he keeps sharp focus on it the whole time he is in the room. He now associates the vets office with really good, fun, and tasty stuff! As I frequently mention, dogs take their cues from us. They can sense when we are stressed and this can impact them greatly. This is why it is important that we control our emotions when working with our dogs. If we get overly excited, they in turn, become stressed. For instance, when working with a dog that is scared of thunder, it is important that during a thunderstorm that you not react to the thunder. 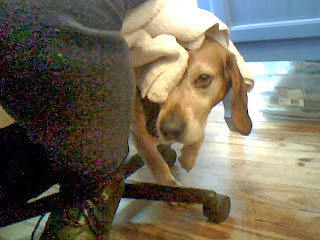 If you make a big deal out of the thunder, the dog's fear will be reinforced. You need to remain calm to help your dog remain calm. It really makes sense if you think about it. If the dog sees you reacting he thinks something like, "the person is upset too thunder must be really bad". The best thing to do is to act like you did not hear the thunder. Don't say, "poor baby" or something like that to the dog. Just let the dog see that the thunder has no effect on you. I do not mean to suggest that this is the magic bullet to correct fear of thunder. However, it will help. There are other techniques that you can use as well. I will be happy to discuss this with you in a training session. I hope this has been of some help for you. If you have issues with an anxious dog or a dog that has some sort of phobia, please contact me. I am happy to help you! happy in his forever home with an entire pack of beagles.